Once you have signed into SureChEMBL, the search interface displays. This interface allows you to perform several different kinds of search. SureChEMBL Query A freestyle search field for performing either a simple text search or a more complex Lucene Query search. Field Search A link that opens the field search area for querying bibliographic fields and keywords in the full text. Available Databases The patent authorities, as well as any journals, and public or proprietary databases available from SureChEMBL’s partners on which searches are performed. Date Filter A mechanism for selecting documents based on the publication date. Structure Input A text field into which you may paste a SMILES or a MOL file. 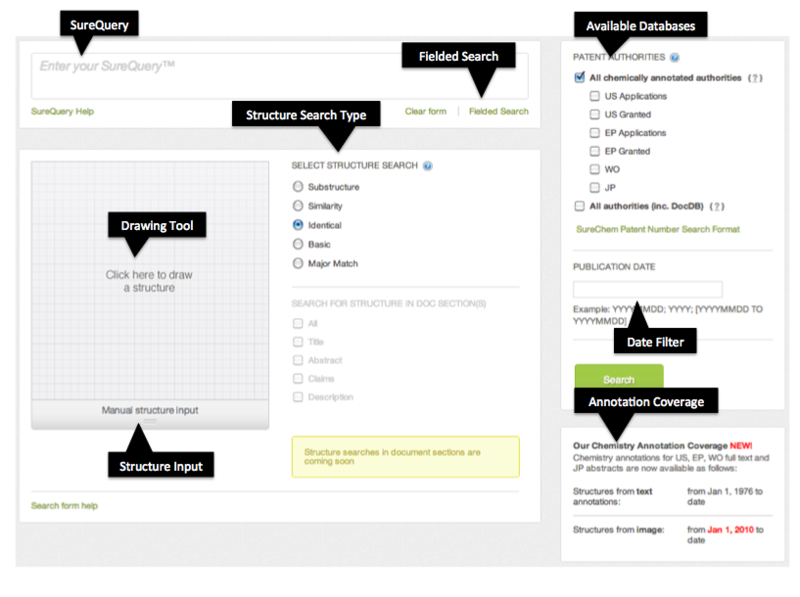 Structure Search Type Chemical structure search options. Annotation Coverage As we feed the patent backfile through our automated chemical annotation pipeline, we provide the exact availability of backfile data. If necessary, click New Search. New Search is available from search results. Provide the desired search text, structure data, and filtering. The Query Status Page displays briefly, followed by the search results.